This is a directory of posts made to support the cause of getting certain languages added to Duolingo. 'Duo goes' posts generally follow the same format - Duo goes to a country, takes in the beautiful scenery, then comes home and makes a course for the language. We are always making more. If you would like to make one, then go here. They are listed here in chronological order. Enjoy! A big thanks to Zzzzz... and Anneysha7 for helping to co-ordinate the projects and the graphics! Zzzzz... kindly made a post to describe how to make a Duo goes post. Please refer to this! NEWS: The Duo Goes series has been passed onto a new willing and highly capable active member of Duolingo, namely Zzzzz.... Here is the new directory. Delighted to see the series resurrected! Duo goes to India - by Pratyush. 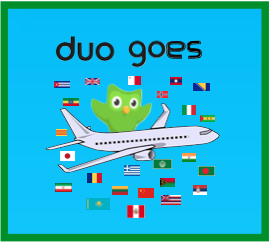 Duo goes to Sicily - by ..Polyglot..
Duo goes to Bangladesh - by Pratyush. Grazzi! I didn't think it would be quite so popular. I of course knew it would from the beginning! I am making you goes to Macedonia right now should be out on,JUNE 27,2017. Did it ever come out? Can we have 1 for Croatian? If you post a few urls here of pictures of Croatian landmarks and pictures of Duo to match them, I will make it for you. How long till Duo goes to Norway? ... Or even Serbia? Mhux problema! If you have a language you're really dying for...? could you make some pictures? could I do a duo goes to Norway? Of course! Post the pictures of Norway and the pictures of Duo the Owl that you want used here. I'm just surprised so many people want to do it! How the heck do you pronounce a glottal stop after an s?! It'd be nice to see one about Khmer as I haven't seen anyone talk about it and there are no good sources online for it. I think it would be a great idea to embrace it here Cambodia is an extremely poor country that has had many beatings, sharing the language could help more people get out there and do charity work. Wow, it's a series now! I've really enjoyed reading them. They really plunge you into the culture of each country and they are all very well written. I better read the third; I haven't read it yet! You know where to go! That's a long waiting list! This is going to be quite some series with all of the countries being visited! There should be a "Duo goes to Qo'noS" for the Klingon course. There will be an Amharic one coming soon enough. People have to ask me which country to make pictures for, and then they need to post a discussion. I really love these posts! I think they're super fun! Hopefully some more will come in the future. There will be more very soon. Can I make a Duo goes to Thailand? You can send me images of Thailand whenever it suits you! What language will they be doing? Australia has hundreds of Indigenous languages. Ok I'll do it :D It's just going to take even longer. Thanks for not taking my comment the wrong way. I wish you all the best! So what language are you doing? No languages... just focusing on Sydney. Again I may sound mean but I don't mean to be. It's not too late for you to revise what you are going to say and include places of significance to the Dharug people. Think of it this way: you have an amazing opportunity to tell the world about one of our awesome languages. Interesting timing, I just started using the website again! Personally I no longer have the time to continue managing a directory but if you want to start a new one as you said and take full control of the whole Duo Goes project, you absolutely can do that. I will add a link to the new directory on this one if you make it. If there's any other way I can chip in, I'll do my best. It's been well over a year since the last addition, so it will be interesting to see how many people remember this! Awesome, I'll keep an eye out! How are the pictures added to the discussions? You can look for an image online, copy its url, and paste it between the parentheses. A complete formatting guide can be found here. Oh, you did it yourself. Well done! It's very, very well done. Thank you, I'm glad you think that! I clicked on the for Duo Goes to South Africa,and it was the same link for China,you aren't having the same problem?No biggie,just curious. Probably Iran by someone who's a genius. Ho hum! Sorry, I don't what that means. The empty slot above under South Africa says "Duo goes to I by G"
No sorry, I meant I don't know what 'ho hum' means. Yes, I never actually got a message from LifeIsTerrible saying s/he wanted to do Vietnam, so I think you can. Notice the waiting list though. Great, thanks! Can you speak Tagalog? Yes! I'm a native speaker ^_^ Just tell me what you need and I'll see what I can provide. :) By the way, I'm really sorry I didn't reply on time. I'm usually busy with school matters. Sorry. That's alright! Have you applied to make a course? In your own time, don't rush your application! Most probably will do! Walang anuman at salamat! Duo goes to Chile is already done, click here, friends! I'm hoping for Duo goes to Malaysia! It seems that there are not many Malaysians who play this game. I don't know why the guys responsible for "Duo goes to " don't answer I sent 3 messegage a year ago to the guy in charge, and he said I'll inform you (I wanted to do one for Azerbaijan) but he hasn't yet answered me. hey zzz, thanks so much for your response; it's so good to finally have some one to answer about this. Sorry, that'll be me (well, probably). I've been super busy, exams etc. Yes, one of latest fascinations. I look forward to making it. Thanks! I can't wait to see it! Maraming salamat! Marunong ka ba ng Tagalog nang perpekto? Hindi ako Pilipino, pero sinusubukan kong matuto ng Tagalog. It should be, "Hindi ako Pilipino, pero sinusubukan kong matuto ng Tagalog." Maraming salamat! Thanks for the corrections too, I will remember that. That's your job! Do you want to do it? Grazzi! Any particular language you're waiting for? Belgium? Belgium speaks three languages and all of them are already here. Where can I find the Duo goes to Slovenia post? Belgium speaks Flemish, that isn't here. 'Duo goes to Slovenia' hasn't been made yet, it's on the waiting list. WOW, I just discovered this series. This is awesome. Some of the language courses have already been created while others are in the incubator. I'll keep checking back to see where Duo goes to next. I stopped by to enjoy Duo's exciting adventures and read comments from Duo friends! Hugs! Learn a language in just 5 minutes a day. For free.